For the next several months I will be exploring my visits to Laughlin from Las Vegas. 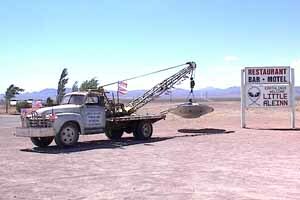 Hopefully, it will answer at least a few of your questions about this section of our great State of Nevada! While the new Interstate 11 is being built with a bypass around Boulder City, it is nice to know that you can still get through this area to go to Laughlin without much difficulty. On the other hand, if you expect to stop at Railroad Pass Hotel & Casino while on your way from Vegas to Laughlin you will have to backtrack a few miles to do so. I-11 has been completed for 2 ½ miles at Railroad Pass and will eventually extend between Nogales, Arizona and Reno, Nevada. It follows US 93, US 95, I-10 and I-19. Going south on US 93 and US 95 connects you to I-11 and you need only to stay in the right-hand lane once I-11 begins. The same exit to go to Searchlight and Laughlin on US 95 is marked with very small signs at the base of the highway, so they are easy to miss. But there really are no changes here for you to worry about, since the same exit ramp is marked for Searchlight/Laughlin. If you want to go to Railroad Pass Hotel & Casino you will exit as if you are going to Searchlight/Laughlin; however, instead of turning right at the Stop and Yield signs at the bottom of the exit ramp, you will go to the stop sign and turn left. You will proceed under the bridge and take another left to go back onto US 93/US 95/I-11 and go 2 miles north (in essence backtracking) and exit at the first stoplight to the right. This is at the entrance to the parking lot of Railroad Pass Hotel & Casino. In the future this area will have a huge truckstop and the hotel and casino will be expanded to accommodate the increased traffic. Since I hate to backtrack (don’t you? ), I bypassed Railroad Pass and made it a stop on the way back to Vegas. But if you need a bathroom break you should stop here because your next break will be in Searchlight, which is 40 miles away. There is nothing in between these two areas except for driving through the Dust Bowl area, which is the Eldorado Dry Lake Bed that stretches for 4 miles. Depending on the time of year that you travel through here, you can be going through a major dust storm; or, if it is raining, the road could be flooded. For this reason, there are electronic signs on either end of this stretch of road warning of any hazards ahead. Otherwise, the road is peaceful with a 75 mph limit. Searchlight is a pass -through town for most drivers. And since it is such a small town on a major highway, it is also a major speed trap. When the signs start slowing you down from 75 to 45 to 35 mph within feet of each other you have arrived! They really mean you should go 35 … until you get to the 25 mph sign. They want you to slow down to see what the town has to offer. That being said, there are actually a few places you can stop while in Searchlight. Most of the through traffic stops at the Terrible Herbst gas station in the southeast part of town for a rest/break and McDonald’s for a meal. They are remodeling the inside of this McDonald’s with only the drive-through open at the time of this writing. 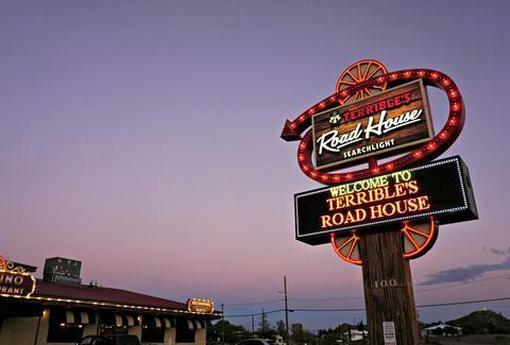 If you are looking for food and are not in a hurry, a couple of blocks north of this gas station is Terrible’s Roadhouse (previously known as the Searchlight Nugget Casino). It is on the east side of the street at the I-95 and Nipton Road (I-164) intersection. They have a full restaurant and counter service where you can get a decent meal (including a baked potato after 4 p.m.) if you are hungry. The food there has been pretty good since they did a remodel of the Nugget. Breakfast is served all day, with a steak and egg breakfast for $9.99. Coffee used to be 10 cents at the old Nugget, but, you still get a deal at the Roadhouse … for 89 cents. 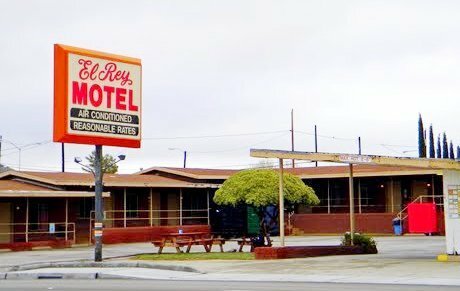 And if you imbibe too much at the bar, there is a motel in town, the El Rey Motel. This is an older, affordable motel with a friendly staff which is being remodeled this year. There are a lot of visitors who stay here when going to the Colorado River or Preserve areas. Cats and dogs are welcome, too. Phone (702) 297-1144 for a reservation or more information. Not to be missed before you leave Searchlight is Gus’ Really Good Jerky store on the opposite (west) side of the street from the Terrible Herbst gas station. 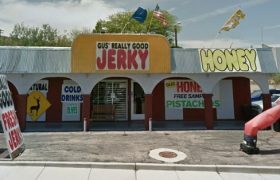 The prices are a little on the high side, but you have your choice of jerky, honey, olives, sausage, dried fruits, nuts, and more. Ask for samples, as they are readily available for trying and are truly fresh and really worth the price. It is a small but pleasant surprise for this area.